This electric adjustable bed is made from hard wood that is painted white, the flat top shaker style bed comes with a Reflex mattress and can come with very useful drawers on wheels for storage. It is also fully installed by our trained engineers, NOT FLAT PACKEDlike some. 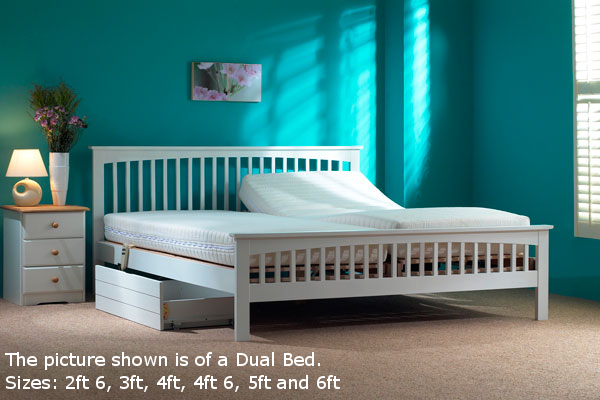 Our standard size bed is 22.5 inches from floor to top of mattress (like most beds) to make sure the height of your bed is correct when ordering please measure your own first if you do need us to change the height we can make it higher or lower for an extra £75*.